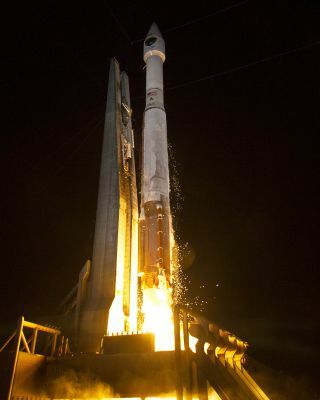 The United States Air Force launched a new GPS satellite atop a United Launch Alliance Atlas 5 rocket on Aug. 1, 2014. The United States Air Force launched a new, advanced GPS satellite into orbit from Florida on Friday. The GPS 2F-7 satellite was propelled into space atop a United Launch Alliance Atlas 5 rocket yesterday (Aug. 1) at 11:23 p.m. EDT (0323 Aug. 2 GMT). Once operational, the new satellite will help increase the capabilities of the Air Force's GPS satellite constellation — a fleet of spacecraft designed to allow military personnel and civilians map their locations, time and velocity around the world. The successful launch is the third GPS satellite launch this year, and GPS 2F-7 is the seventh in a series of 12 satellites planned for launch to further strengthen the constellation. The GPS satellite network is the largest Department of Defense-operated constellation. "The satellite will incorporate various improvements to provide greater accuracy, increased signal and enhanced performance for GPS users around the world," Laura Maginnis, ULA's deputy director of mission management, told reporters before launch. Once in orbit and functioning, the $245 million GPS 2F-7 will allow another satellite to move into a different position, and facilitate the replacement of a satellite launched to orbit in 1992. "GPS is a system of satellites, ground stations and user equipment that produce the signals needed to enable positioning, navigation and timing services to users worldwide," Col. Bill Cooley, director of the Global Positioning System Directorate, told reporters. "The GPS constellation is healthy, robust and more capable than it has ever been in GPS history." GPS 2F-7 joins the six other GPS 2F satellites already orbiting Earth. Each of the advanced satellites is designed to last at least 12 years on orbit. The next GPS 2F satellite is currently scheduled for launch in late October, with a couple more GPS 2F launches scheduled for 2015, according to Walter Lauderdale, GPS 2F-7 mission director. Space.com partner Spaceflight Now provided up-to-the-minute information about the launch through their Mission Status Center. Space fans can also follow United Launch Alliance's Twitter page for updates from the spaceflight company.